April 27, 2015 in Joburg, Restaurant Reviews. We go to the park several times a week. Yet, I have never managed to capture that perfect picture – Mia bounding across, fulll of life and joy. Until last week, when I did manage to click this ons. Here is my take on motion. April 25, 2015 in Photo Challenges. April 20, 2015 in Just Musings. I am not an early riser and so it wasn’t easy to find a picture for this week’s challenge. The only time you can get me out of bed before dawn is if I am travelling! So here is a picture from a recent trip taken as the sun was coming up. April 19, 2015 in Photo Challenges. April 16, 2015 in Johannesburg, Just Musings, Moving to South Africa. 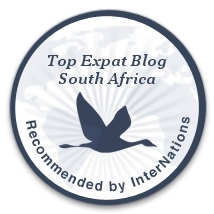 April 13, 2015 in My Travelogue, Pet Friendly Resources, South Africa, Tsitsikamma & Storms River. Hot air balloons soaring over Cappadocia, Turkey. My entry for this week’s WPC – afloat. Image courtesy, my sister-in-law – Kara! April 11, 2015 in Photo Challenges. April 10, 2015 in My Travelogue, South Africa, Tsitsikamma & Storms River.